Only a few more days until the new Annual Catalog goes live. One of my favorite new products is the Daisy Delight Stamp Set and coordinating Daisy Punch. The punch was so popular during the demonstrator pre-order that unfortunately it is on backorder but I was fortunate to get mine. This is one of the cards my ladies will be able to make at my New Catalog Open House next Wednesday, and I'm pretty sure it will be one of their favorite new items too. Other new products used are Powder Pink and Berry Burst Ink, Berry Burst Card Stock, a layer of Fresh Floral Designer Series Paper and a Gold Faceted Gem Embellishment. 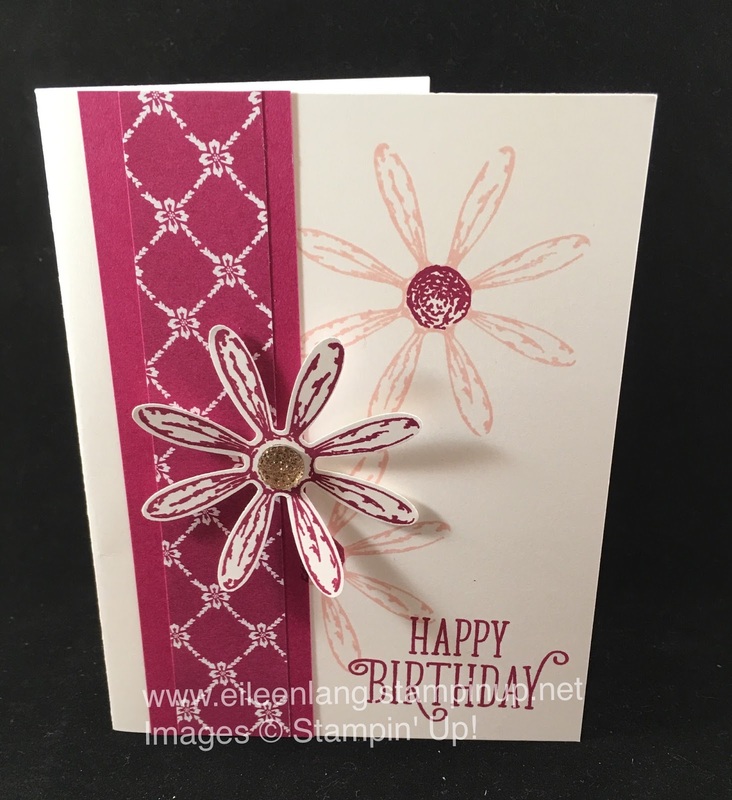 The Happy Birthday sentiment is from another new set called Happy Birthday Gorgeous. Soon all of these products can be yours. If you do not have a relationship with another Stampin' Up! demonstrator and would like your own free catalog, leave a comment or send me an e-mail. My customers will be picking up their copies on Wednesday, May 31st at my Open House. If you are in my area, feel free to stop by between the hours of 10 am - 1 pm and then again from 6 pm - 9 pm.